New World Library, 9781608685424, 216pp. The phrase "it's a dog's life" connotes happy-go-lucky days of pleasure and ease. But our canine companions are in many ways our captives. No matter how cushy their captivity, we decide what and when they eat; where they sleep, poop, and play; when they can walk and when they must sit or stay. As the demand for dog trainers and veterinary behaviorists attests, dogs are not naturally adapted to living with and among modern humans. They give up a lot of freedom and instinctual pleasure, as well as their innate strategies for coping with stress and anxiety, in exchange for the comfort and care they get from humans. 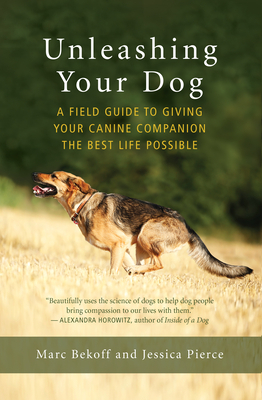 Bekoff and Pierce show that it is possible to let dogs be dogs without wreaking havoc on our own lives. They begin by illuminating the true nature of dogs and helping us "walk in their paws." They reveal what smell, taste, touch, sight, and hearing mean to dogs and then guide readers through everyday ways of enhancing a dog's freedom and minimizing deprivations in safe, mutually happy ways. The rewards, they show, are great -- for dog and human alike. The author or editor of thirty books, Marc Bekoff, PhD, is professor emeritus of ecology and evolutionary biology at the University of Colorado, Boulder, and a former Guggenheim fellow. The author of ten books and hundreds of articles, Jessica Pierce, PhD, is faculty affiliate at the University of Colorado Center for Bioethics and Humanities.